Description: Bethel College class of 1897. 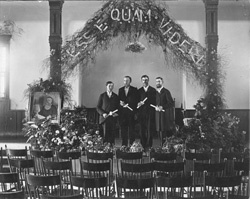 Left to right, Otto Lichti, Jacob B. Epp, Henry Bachmann, Peter A. Penner. The picture of Menno Simons was presented to the teachers and students of Mennonite history of Bethel College, May 7, 1897, by the Junior Christian Endeavor Society of the First Mennonite Church of Philadelphia, Pennsylvania.